Thoroughbred racing has made progress drafting and promoting tougher sanctions for medication violations across all racing states through the Uniform Medication and Penalty Model Rules. These proposed rules, drafted by the Racing Medication & Testing Consortium and the Association of Racing Commissioners International, do include tougher penalties for both trainers and owners, uniform laboratory testing standards, and uniform medication thresholds. Under the proposed penalty system, for example, a trainer who has his first positive from Class 1 and most Class 2 drugs, which include the most powerful painkillers and substances most likely to influence the outcome of a race, could get a one-year suspension and a fine. A second offense could result in a three-year suspension and a fine while a third offense carries a minimum five-year suspension and a minimum fine of $50,000. If the case involves aggravating circumstances, the fine could rise to $100,000 on the third offense. Losing your livelihood for a year on a first offense should certainly get a lot of trainers’ attention. The model rules also include new penalties for owners. Whether it is offense number one or number three, the owner will always lose any purse money and his horse will be disqualified. On the first offense for a Category A penalty (involving largely Class 1 and Class 2 drugs), the horse that tested positive will be ineligible to race for 90 days and then must pass a commission-approved examination before being declared eligible to race. On the second offense the suspension is 120 days, and 180 days on the third offense. While all this effort is laudable, the issue of uniform adoption still faces huge obstacles. To date, four states have taken no action toward even considering the new rules—Florida, Louisiana, Oklahoma, and Colorado. So even if every other racing state besides these four were to embrace the new rules fully, horse racing in the U.S. still would have a regulatory patchwork. And yet to be determined is whether the new rules ultimately provide true deterrence against cheating. 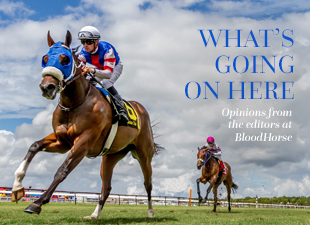 Horse racing may not get the chance to find out. The stonewalling by these four states, even though a small minority among 38 racing states, reinforces the biggest criticism against Thoroughbred racing—that it lacks the ability to police itself thoroughly and the collective will to implement real change when necessary. Horse racing is only slightly better off than the International Olympic Committee and the U.S. Olympic Committee in the 1990s. At that time these organizations had no uniform policy on violations, on what was being tested for, the procedure for collection and chain of custody for samples, and varying sanctions for rule violations. What changed the Olympics’ course was the formation of the World Anti-Doping Agency, known as WADA. This private organization created a uniform code, which was drafted and revised multiple times in an open and transparent process. The code has since been adopted by 520 sporting organizations and 172 governments. “There is no reason why this same effort could not be done for the horse racing industry in the U.S.,” Travis Tygart, CEO of the U.S. Anti-Doping Agency, told a U.S. congressional subcommittee back in 2013. The USADA was formed in 1999 because the U.S. Olympic Committee realized it could not police itself. Drafting tougher rules is great, but every racing jurisdiction and every association must buy into those rules. Meanwhile, everyone’s patience with the sport is threadbare—owners, regulators, and fans. Oversight by a national organization, perhaps the USADA, may be the only way to right horse racing’s badly listing ship. Such a change will elicit bitter and angry cries of protest, to be sure. But look around at what little real reform we’ve accomplished. It’s not like we haven’t had the time.